Head Trainer and Owner of HIT Bill Baldridge working out Colin Crothers of Benet and Sammy Schultz of Oswego East. Both players are 6'8 and play for HIT's 17U Elite Team. HIT Trainee for 3 years Francesca "Frankie" Kokkines of Montini on her official signing with Southern Illinois. 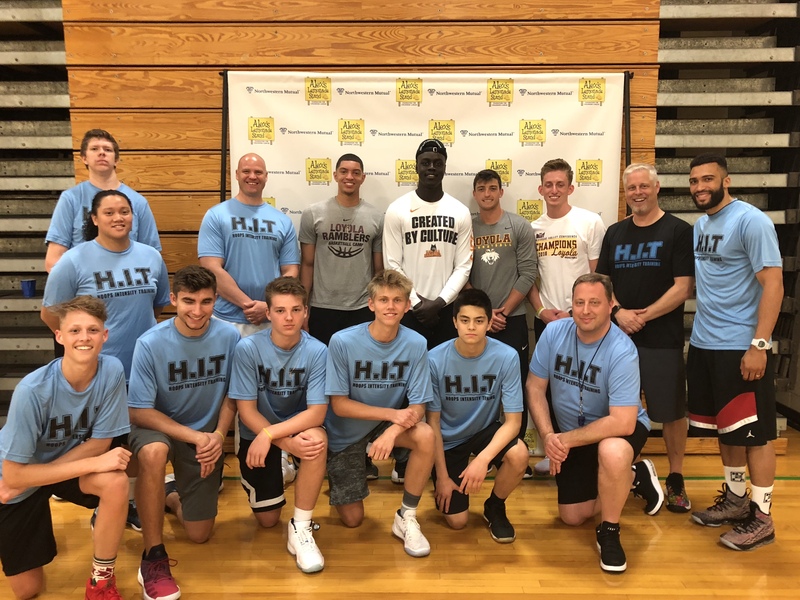 HIT Basketball, Elmhurst Airborne, and Northwest Mutual all hooked up with players from Loyola's Final 4 Team to raise money for childhood cancer. All 3 groups did a basketball clinic at York HS on June 24th to raise money for Alex's Lemonade Stand which is a great charity. The event raised over $4,000 dollars for research!!! I want to thank everyone who came out to give their time and money. The event had almost a 100 players come for the clinic and autographs!! Hoops Intensity Training or "H.I.T" is the best basketball training program in the Chicagoland area. Most training takes place in centrally located Elmhurst IL. H.I.T currently trains some of the best boys and girls players in the area. We also have a 17U team that plays in the NY2LA League which is one of the best in the country. The 17U team was nationally ranked this past season. We train all ages and specialize in our own Academy Style Training. HIT Basketball is now training all the grade school girls for the Illinois Rockets. This training takes place in Naperville at Supreme Courts. ©2019 Hoops Intensity Training / SportsEngine. All Rights Reserved.